VW brands, Jeep, Lexus gain auto sales in Europe in MAy; BMW, Mercedes fall. 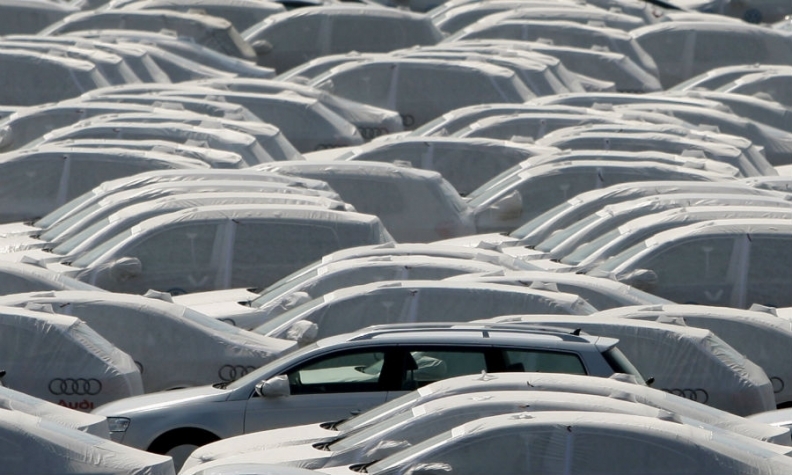 European passenger car sales rose a marginal 0.6 percent in May due in part to fewer working days. Registrations rose to 1.44 million cars last month in the European Union (EU) and European Free Trade Association (EFTA) countries, industry association said in a statement, from 1.43 million a year earlier. The market was also held back by religious holidays in some countries that shifted into May from June last year. Sales by France's PSA Group soared 58 percent as registrations of the newly-acquired Opel-Vauxhall division were not included in year-earlier records. Demand for the Peugeot brand grew 3.2 percent, but fell 3.3 percent for Citroen. Opel sales fell to 81,752 from 86,517 in May 2017 under previous owner General Motors. Renault posted a 6.5 percent increase with Renault brand up 3 percent and Dacia sales gaining 14 percent. Volkswagen Group sales increased 3.7 with sales lifted by 25 percent growth at Seat on new SUVs and a 5.7 percent increase in demand for VW brand cars. Porsche sales grew by 5.4 percent but Audi was down 5.3 percent and Skoda volume fell 2.2 percent. May registrations were flat at Fiat Chrysler Automobiles, hit by an 11 percent drop in demand for its mass-market Fiat brand and despite sales of Jeep SUVs doubling on demand for the new Wrangler. Ford Motor sales grew by just 0.5 percent. Premium German brands BMW and Daimler's Mercedes-Benz posted declines of 7.7 percent and 6.1 percent respectively, as buyers shunned their diesel cars amid talk of diesel bans in German cities. "Audi and also BMW are both suffering under relatively old model fleets," and buyers seem to be holding back until the manufacturers bring out new models, Juergen Pieper, a Frankfurt-based analyst at Bankhaus Metzler, said. Daimler's dispute with German regulators over diesel-car emissions, resolved this month, may also have reduced Mercedes' sales in May, he said. 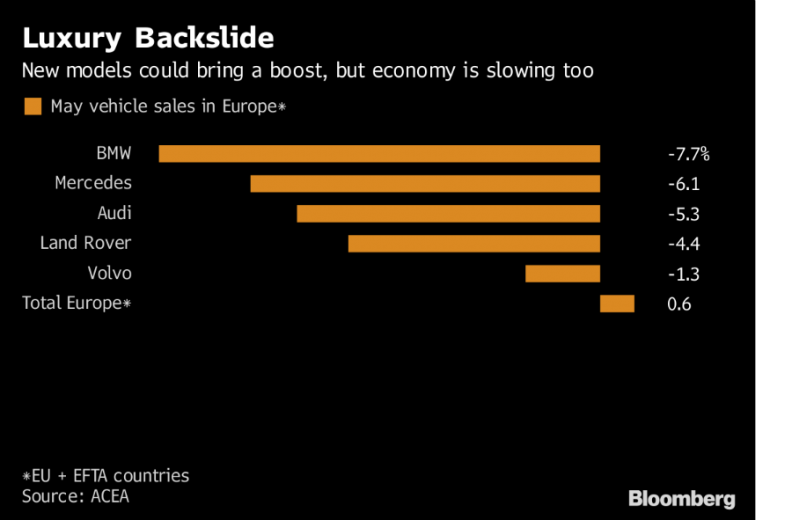 The luxury-segment slump comes as the region’s economy has been in a "soft patch," according to European Central Bank President Mario Draghi. Nonetheless, activity is strong enough to overcome increased risk, he said Thursday. German carmakers count on reliable sales of their conventional models to finance heavy investments into electric and self-driving vehicles. Asian brands had mixed results. Sales at Toyota Group grew 4.2 percent, helped by a healthy 21 percent gain at its Lexus brand on demand for the NX SUV. Toyota brand's volume was up 3.2 percent. Nissan's volume was down 16 percent while Kia gained 3.4 percent and Hyundai's volume rose 2.3 percent. Download PDF, above right, for May sales by automaker and brand. Among the five major markets, sales were flat in France, but grew in the UK and Spain, up 3.4 percent and 7.2 percent, respectively. Registrations contracted 2.8 percent in Italy, which was rocked by political turmoil last month, and fell 5.8 percent in the region's biggest market, Germany. For the first five months, European sales increased 2.2 percent, helped by double-digit growth in new EU member states including Bulgaria, Lithuania, Romania and Hungary. Demand has been growing most months since, as a pick up in consumer confidence, retail incentives and new product launches lured customers back to the showrooms, although the fallout of the diesel-emissions scandal has weighed.